All of these, except the second last, are pressed powders (MAC Pigment is loose powder formulation). *MAC Blackground isn't the best choice on the planet as there's a slight sparkle to it, however I just wanted to check pigmentation and blendability on top of a black primer/base. The pigmentation is evident, and as you can see, if you really really want to have an intense black, you need to push the colour on top of a black cream primer. The best matte black shades just pushed straight onto the skin (no blending) would appear to be MAC Pigment in Black Black, Urban Decay Black Dog, Sleek Noir and Bourjois Intense Extrait de Fard #10. However once you blend them out, most of them lose most of their intensity. At this point, Sleek Noir and Bourjois Intense Extrait de Fard #10 look like the best dark black options. Once we apply a primer however, we see a slight change... MAC Pigment in Black Black, Urban Decay Black Dog, Sleek Noir and Bourjois Intense Extrait de Fard #10 are still quite intense black, but so too is Stars Makeup Haven Unzipped. Personally I think that Urban Decay Black Dog looks best here. Primer plus blending gives a different story though... all of the shades mentioned above (applied on top of primer) still keep their intensity. Urban Decay Black Dog looked like the clear winner to me. Incidentally, when cleaning all of these off with a cotton bud and eye makeup remover, the Bourjois Intense Extrait de Fard #10, NARS Pandora duo black, Urban Decay Black Dog and MAC Pigment in Black Black were the toughest to remove, with the others coming away much easier. This was very easy to apply, very easy to blend and reasonably fine texture. Very finely milled, felt soft, didn't drag on eyes. Felt slightly gritty. Blended well but took a bit of work. Felt a little loose, the shadow does give quite a lot of fall-out and takes a bit of effort to blend, a lot of Sleek colours are the same in terms of fall-out and a bit more effort required to blend, but given the price they are well worth it (around €8 or €9 for a 12 colour palette). I believe this Palette is now discontinued. The shadow is quite finely milled and easy to use, however the colour is more grey-ish than black. Looks a little like a dark charcoal brown in the pan, it is reasonably finely milled and easy to work with, but not particularly intense black. This is touted by many as the "ultimate matte black". I don't see it. It's a little tougher to blend out than I would have expected, it's not particularly finely milled and it certainly isn't soft, it feels harsh and chalky, although it doesn't look it, on the skin. Reasonably black, but still not dark enough. OK to work with, soft and blendable. Awful. The first black I ever got and I never reach for it. It is bad in terms of pigmentation. This one took me 7 swatches (at this point I gave up) to get it any way opaque. It doesn't blend particularly well, it's not particularly finely milled. Awful across the board. Reasonably easy to work with but not the easiest to blend out cleanly. It does have some of the best pigmentation though. Easy to work with, easy to blend, soft... the only problem that most people have with pigments is the propensity for dropping them or knocking them over and making a horrendously awful mess, ruining your mother's carpet while visiting of a weekend, and having to hide it with a rug**. This is not a bad option for a matte black, but as far as I know, it's a PRO colour, so not the easiest to get your mitts on. In addition, you're going to have a large amount of black fall-out on your cheeks when you work with pigments. That's not a problem, but worth remembering. Silky soft, easy to blend, but difficult to get a lot of the product packed on (5 coats later with no primer, you can see it was still quite patchy). Black "enough" but not worth purchasing, there are better matte blacks available. A pity, I was expecting great things from the Makeup Forever offering. There's a plethora of other "Matte Blacks" out there. MAC also have Typographic and Nehru, but I find both of these even lighter than Carbon (which is why I didn't bother including them). 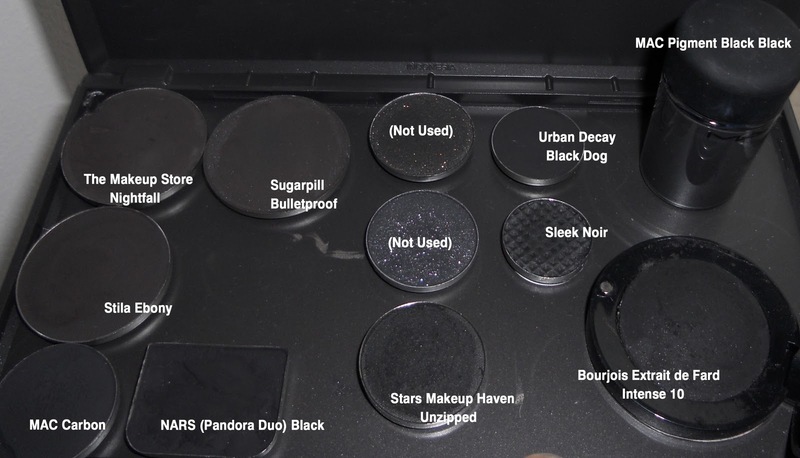 Urban Decay also has Perversion and Blackout, the latter is supposedly better to work with than Black Dog, but I don't have it so I can't comment; the former is a "good enough" black but not particularly uber-dark. In terms of personal preference, I usually reach for either Sleek Noir, Urban Decay Black Dog or MAC Black Black pigment. Overall best pigmentation? Probably Urban Decay Black Dog. Personal preference? Urban Decay Black Dog (I know that I will have to work with it a bit). All of this assumes (a) using a black primer underneath to get maximum intensity and (b) doing my foundation afterwards... black makes a mess. If I were on a budget? Hands-down, Sleek. Just make sure you get one of the palettes that have Noir in them (eg the Sleek Good Girl palette doesn't have it but I think most of the other palettes do). Use a black cream primer/base first to increase shade intensity. Tap excess off your brush so you get less fall-out. Build up gradually. Press onto your eyes with a flat brush or your fingers. Blend with good blending brushes. You'll need a few blending brushes on the go at once when working with black shadows, as your brushes get dirty pretty quickly. Do your eyes first, clean up fall-out, then continue with your foundation etc. Black eye shadow will also look more intense if you use a black liner in your waterline and lash line, and a really black mascara (it's all about increasing the contrast with the whites of your eyes as well as your skin).